Well, here we are again ... two years on .... another regatta ... doesn't time fly! The Bigton Regatta will take place a week later as normal, on Saturday 10th June 2017, at the St Ninian's Isle sand. As has become tradition, daytime activities will include a BBQ (with gluten-free and vegetarian options), soup and sandwiches, teas & coffees, sweeties, sand-castle competition, beer tent and tug o' war. Unfortunately, our beach volleyball net is no more ... but bring your footballs, cricket sets, tennis rackets, etc. There's a BIG beach to play on! And, of course, there wil be lots of rowing! At night we'll be having live music in the beer tent, and a beach bonfire. It's a great fun-filled family day and night on the beach. NOTE: Photo ID must be presented before alcohol can be purchased in the beer tent. No ID ... no booze! We would also like to remind you that purchasing alcohol for under 18's is illegal. Bar will close at 1am. Weather forecast is ... bound to be great! Boats in the water 2.30pm for first race at 3.00pm please. ACCESS TO THE SAND - As in previous years, there will be a towing service for the yoals, available from the carpark. If you wish to use your own 4x4, please take direction from the stewards, DRIVE SLOWLY and keep a sharp eye out for children. 4x4's may park on the sand. All trailers will be left on the sand. Please be considerate and leave the lower carpark free for elderly and disabled users, and those with very young children. All cars please take direction from the parking stewards. 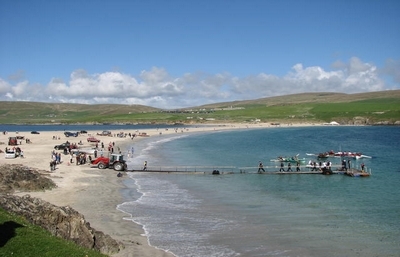 Please remember you will be launching your yoal from the sand, not a pier or slip-way, and you will get wet! Please come prepared for this. Help will be on hand, but a change of clothes (or a wetsuit or bikini depending on the weather) is probably advisable. In the very unlikely event of the rowing races being cancelled due to weather, the party will still carry on at the beach. So please join us. The RACE DAY contact has been given to all clubs. Please only phone this number if you have questions ON SATURDAY ONLY. Any major changes or cancellations WILL posted on Facebook. Please email webmaster@bigtonrowingclub.co.uk, pop a message on the rowing club Facebook page, or contact a committee member if you have any questions at any other time. Details on the contact page. RACE DAY ROTA - FOR BIGTON ROWING CLUB MEMBERS - Click here!